BANZAI PIPELINE, Oahu/Hawaii (Thursday, December 17, 2015) – After what can only be called the most dramatic day in pro surfing history, Brazilian Adriano de Souza (BRA) has clinched the 2015 World Surf League (WSL) Title at the world-renowned Banzai Pipeline in Oahu, Hawaii. In the process, he also became the first Brazilian to win the Billabong Pipe Masters in Memory of Andy Irons. Surfing for ten years amongst the world’s elite and setting the stage for the rise of the ‘Brazilian Storm,’ De Souza’s Title clinching performance came with a significant wave of emotions, as he dedicated the victory to fallen compatriot Ricardo dos Santos who died earlier this year. The final day of the 2015 Samsung Galaxy WSL Championship Tour began with three contenders in the hunt for the world surfing crown – Mick Fanning (AUS), Gabriel Medina (BRA) and de Souza. Fanning’s Quarterfinal win over 11-time WSL Champion Kelly Slater (USA) ousted Medina from the race, but a huge aerial manoeuvre from Medina late in their Semifinal eliminated the Australian from competition, leaving the way open for compatriot De Souza to claim the World Title. Taking down explosive wildcard in Mason Ho (HAW) in their Semifinal duel, de Souza claimed the coveted World Title after a loss earlier in the year at the Moche Rip Curl Pro had him doubting his chances heading into Pipeline. Fanning came into Pipeline having won his first-ever Hawaiian event at the Vans World Cup of Surfing and looked to be the favourite to win the World Title. But after being eliminated by Medina, his Title chances were left in the hands of Ho, who couldn’t seal it for the three-time WSL Champion despite Fanning’s incredible win over Kelly Slater (USA). 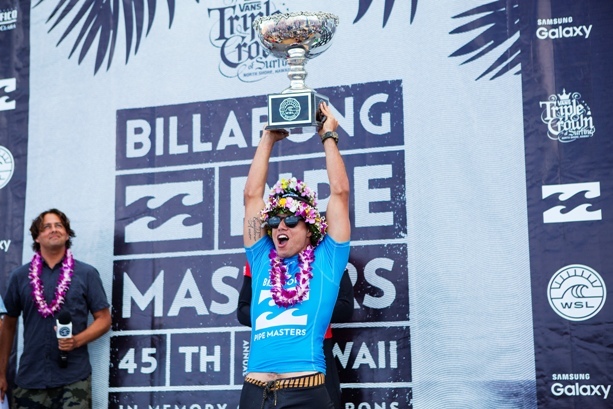 Claiming runner-up status at the Billabong Pipe Masters for the second consecutive year and the first Brazilian to earn a Vans Triple Crown of Surfing title, Gabriel Medina (BRA) achieved a phenomenal comeback after a tough start to 2015. Turning his season around at the Billabong Pro Tahiti with a runner-up finish, the 2014 WSL Champion stood proud hoisting his well-deserved trophy. It was Medina who ended C.J. Hobgood’s (USA) final run at a Pipe Master title in their Quarterfinal, handing the 2001 World Champion a fifth place finish in his last WSL Championship Tour competition. The 36-year-old Florida native spent 17 years on the dream tour – giving fans and fellow competitors so many fond memories to look back on. De Souza joins Carissa Moore (HAW) as 2015 WSL Champion; Moore won her title at Maui earlier this month. The world’s best surfers will return in 2016 with the kick-off event at Gold Coast in Queensland, Australia in March. BANZAI PIPELINE, Oahu/Hawaii (Wednesday, December 16, 2015) – A phenomenal day of the world’s best surfers battling solid eight-to-ten foot (2.5 – 3 metre) waves at the Banzai Pipeline has whittled the WSL Title contenders down to three and the Billabong Pipe Masters contenders down to nine, setting up an epic finish to the 2015 season on Thursday. The final stop of the 2015 Samsung Galaxy WSL Championship Tour season as well as the Vans Triple Crown of Surfing (a WSL Specialty Series) and the Billabong Pipe Masters in Memory of Andy Irons enjoyed a marathon day of competition, witnessing perfect scores and terrifying injuries from the world’s best surfers. The World Title race is now down to three competitors as current Jeep Rankings’ Leader Mick Fanning (AUS), Adriano de Souza (BRA) and Gabriel Medina (BRA) are through to the Quarterfinals. Julian Wilson (AUS) and World No.2 Filipe Toledo (BRA) are both out of title contention, having been eliminated from competition in Round 3. Medina eliminated South Africa’s Jordy Smith (ZAF) in the first heat of the day. Reading the unsettled early morning conditions perfectly, the 2014 World Champion dodged the massive sets that rolled through from the Third Reef and then picked off the waves that enabled him to get deep inside, and emerge from, hollow spitting barrels. The 13th place finish leaves Smith, who was ranked No. 29 on the Jeep rankings leaderboard going into the season-ending event, well outside the Top 22 who will qualify for the 2016 WSL Championship Tour. However, the South African is the frontrunner for the annual WSL injury wildcard after missing five events while recovering from leg and back injuries this year. Fanning, who woke to the devastating news that his eldest brother had passed away overnight back in Australia, came into the most anticipated heat of Round 3, facing off against 2004 Pipe Masters champion Jamie O’Brien (HAW) in building Pipeline conditions. Finding an 8.47 on his opening ride, Fanning held off O’Brien for the majority of the heat – combo’ing the former Pipe Master by the final horn. After overcoming the challenge presented by O’Brien, Fanning drew two Pipeline specialists in Kelly Slater (USA) and John John Florence (HAW) for an incredible Round 4 match-up. After what pundits are calling “the heat of the year,” with all three surfers exchanging high scores, Fanning came out on top with a 17.30 heat total to earn his place in the Quarterfinals. Keeping pace with Fanning, current World No.3 Adriano de Souza (BRA) earned a direct pass to his first Pipe Masters Quarterfinal appearance after surviving a Round 3 bout with Glenn Hall (IRL) and coming out on top in Round 4 over Josh Kerr (AUS) and Adam Melling (AUS). The 10-year CT veteran is seeking a maiden WSL Title and knows exactly what needs to be done. Though his 2015 Title hopes remain slim, reigning WSL Champion Gabriel Medina (BRA) looked unbeatable throughout the day. After taking down Smith in the opening heat of Round 3, Medina continued to charge through Round 4 over C.J. Hobgood (USA) and Keanu Asing (HAW). 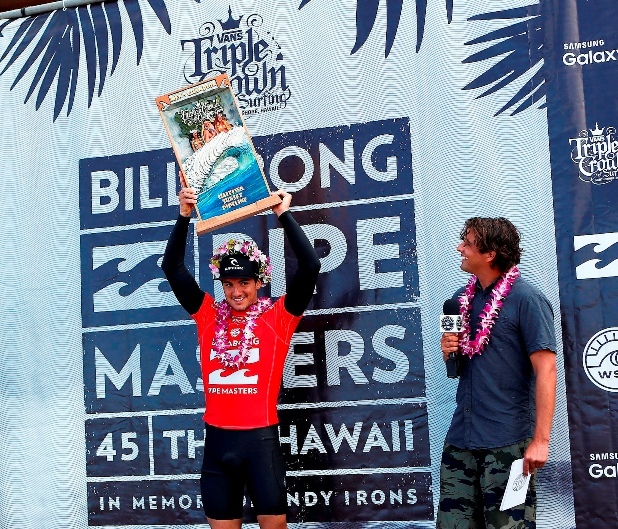 Mason Ho (HAW), Billabong Pipe Masters wildcard, created a massive upset this morning in eliminating current World No. 2 Filipe Toledo (BRA) from the event and the WSL Title race. Ho continued his impressive form and opened up Heat 3, Round 4 heat against former Pipe Masters Joel Parkinson (AUS) and Jeremy Flores (FRA) with a 10-point ride, helping the young Hawaiian advance directly into the Quarterfinals. Toledo’s WSL Title run came to an end after a phenomenal 2015 CT season, claiming three event wins at the Quiksilver Pro Gold Coast, Oi Rio Pro and the Moche Rip Curl Pro – earning a perfect 10 at each contest. The 20-year-old is poised for another big year next season after gaining a wealth of knowledge contending for a Title. “This has been an amazing year for sure – it’s been the best one of my career,” Toledo said. “I had a lot of fun the whole time with the boys fighting for the World Title and I had my chance. It didn’t happen this year but next year I will be back stronger. It’s my first year competing in the World Title race and just really happy to come to Hawaii with a chance to win. Julian Wilson (AUS), one of the form surfers of the season, was also eliminated from the 2015 WSL Title race at the hands of compatriot Adam Melling (AUS). Melling, who entered the Billabong Pipe Masters rated 26th, is through to the Quarterfinals and hunting a requalification bid for 2016. The incredible force of Pipeline was felt today as numerous excellent scores, including three perfect 10 point rides, were posted, but the world-renowned wave also unleashed its wrath with former Pipe Master Bede Durbidge (AUS) suffering a horrific wipeout. After committing to a heavy drop on his opening wave, Durbidge couldn’t hold on and was thrown onto the shallow reef. Event organizers will reconvene tomorrow morning at 7am to reassess conditions. The swell is expected to be trend down through Thursday but to still provide an epic playing field for the tour finale and the crowning of the 2015 WSL Champion. When competition resumes, up first will be Josh Kerr (AUS) against Jeremy Flores (FRA) in the final heat of Round 5. Highlights from Wednesday are available at WorldSurfLeague.com where the final day’s action can be watched live, starting at 7.30pm South African time. BANZAI PIPELINE, Oahu/Hawaii (Thursday, December 10, 2015) – The final stop of the Samsung Galaxy WSL Men’s Championship Tour and Vans Triple Crown of Surfing, the Billabong Pipe Masters In Memory of Andy Irons, completed the opening round of competition on Thursday in shifting 2.5-3m (eight-to-ten foot) waves at Banzai Pipeline. With strong trade-winds consistent throughout the day and a predominant North swell on offer, Round 1 had moments of brilliance amidst unruly rip currents sweeping the lineup as the world’s best tackled the world’s most notorious wave. C.J. Hobgood (USA), the 2001 World Champion who announced 2015 earlier this year that 2015 would be his retirement season, entered the final event of his pro career here at Pipeline. The Floridian came out swinging against Taj Burrow (AUS) and 11-time WSL Champion Kelly Slater (USA), who between them boast 57 years of experience at the highest level of pro surfing. Hobgood opened his account with a Perfect 10 point ride, finding a near-impossible exit that had the crowd on their feet en route to earning the highest heat total of 14.97. Following Owen Wright’s (AUS) withdrawal from competition due to concussion suffered in a free-surf session on Wednesday, the 2015 World Title is now down to five contenders at Pipeline. Leading the charge is Mick Fanning (AUS) who weathered the challenge of 2001 Pipe Master Bruce Irons (HAW) and Sebastian Zietz (HAW) with a 9.43 that earned the Jeep Rankings’ Leader a Round 1 victory. Current World No.4 Gabriel Medina (BRA) increased his odds of earning back-to-back World Titles with a Round 1 victory over Keanu Asing (HAW) and Wade Carmichael (AUS). The 21 year-old reigning world champion looked in-form and poses a serious threat to the Title race with a carefree approach, knowing his chances are narrow. While Fanning and Medina are safely through to Round 3, World No.2 Filipe Toledo (BRA), No.3 Adriano De Souza (BRA) and No.7 Julian Wilson (AUS) all face elimination in Round 2 against formidable opponents. De Souza will face the Pipe Invitational Winner Jack Robinson (AUS) in Heat 3 and Wilson has to battle current Vans Triple Crown of Surfing ratings leader Carmichael in Heat 5. South Africa’s Jordy Smith returned to competition after a five-event injury enforced layoff. Contesting his first heat since the J-Bay Open in July, Smith caught a couple of solid waves but finished runner-up behind 2010 Pipe Masters winner Jeremy Flores (FRA) and faces dangerous rookie Wiggolly Dantas (BRA) in R2. Organisers will reconvene tomorrow morning at 7:00am to reassess conditions. Up first, Toledo will be pitted against former Pipe Master Bruce Irons (HAW) in Heat 1, Round 2 when competition commences. The surf fades through Friday as trades also ease. Small NW swell prevails over the weekend, with much lighter wind. Confidence is increasing that a strong NW swell will build in through the middle part of next week as trades also rebuild. The Billabong Pipe Masters will be webcast LIVE on WorldSurfLeague.com and on the WSL app starting from 7.30 pm South African time daily. After 15 years as one of the city’s most iconic hotspots, Rafikis Bar and Restaurant is celebrating its last season in business with a series of incredible surfboard give-aways, starting this Thursday (10 December). Rafikis (which means ‘friend’ in Swahili) have commissioned four limited edition surfboards from VuDu Surf and had each one turned into a unique piece of art by resident artist Buffy Brave Art, whose murals give this popular venue its distinctive ambience. 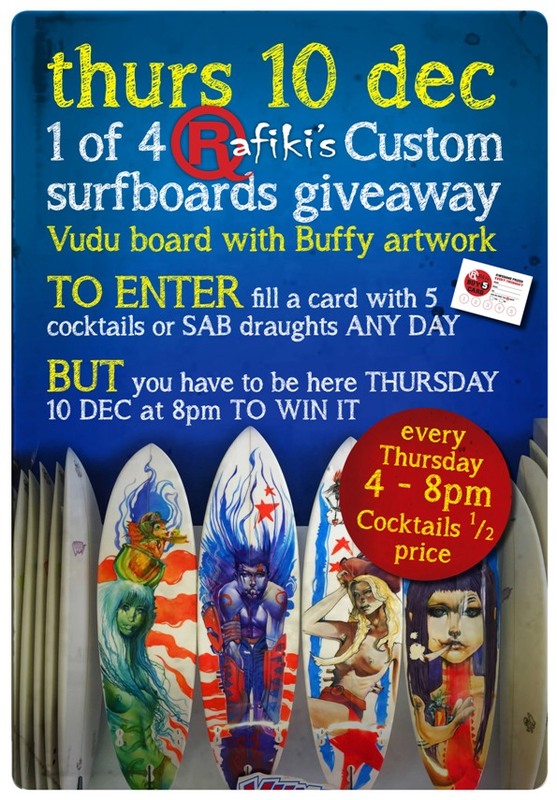 The surfboards will be given away as part of the regular Thursday Prize Nights, when cocktails are half-price from 4-8pm and patrons can win items ranging from concert tickets from Webtickets and custom Rafikis gear to SAB Newlands Brewery Tours. A lucky customer will take home the first surfboard this Thursday simply by completing an entry form, purchasing five half-price cocktails or SAB draughts, and being at Rafikis between 7pm and 8pm when the draw is made. So whether you (or a friend) need a new surfboard, or want an original piece of artwork, be at Rafikis this Thursday between 7pm and 8pm to take advantage of this great offer. And if at first you don’t succeed, make sure you’re back on the last Thursday of the next three months for the chance to become a winner. Regular patrons over the past 15 years are invited relive the memories of their favourite watering hole before Rafikis closes its doors in June 2016.